I think for Tyler's point, we can be generic and say that, for all intensive purposes, longsword and katana can be treated with the same basic concepts, particularly since we're just talking through text. Given Tyler's declared background and our past debates, I suspected that he was being ethnospecific, in terms of swords (i.e., I thought he was specifically arguing in favor of the katana in this case). If I am mistaken in that regard, I apologize. There are no European manuals known from the heyday of sword + shield combat, but there are a number or later works which do describe some issues of sword + shield combat. Marozzo and McBane discuss these issues. Of course there are a number of works dealing with sword + buckler. I think what Tyler meant was that there is no "living lineage" of European sword-and-shield use. I second that. There's no other martial art that uses the sword in such a way. However, there are techniques in JSA that somewhat resemble half-swording (IIRC). Once I saw a documentary about India where they showed one guy that teaches Indian martial arts. He was using a sword that looked like a longsword with a blade widening at the tip. The hilt looked a bit like a saber-hilt (knuckle-guard, but no cross)and was only long enough for one hand but had some kind of a tang-extension. This way the sword could be gripped with both hands. But back to halfswording: The guy mentioned above showed some flourishes/katas where he gripped the sword with one hand on the ricasso (which seemed to be almost 1/3 of the blade) and the other hand on the normal grip. The techniques looked like little stabbing and slashing movements, very narrow, no exaggerated big movements. 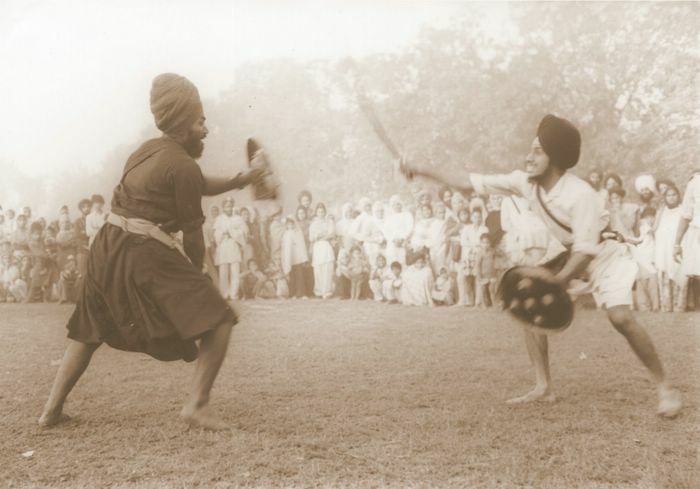 In fact, looking at those images, it seems to be a specifically Sikh Martial Art. Thank you Mikko and Hisham! Quite an interesting design, that is. I wonder how they ended up with such a blade-form, but it's definitely a design optimized for cutting. One of them seems to be slightly curved forwards , a bit like a longsword version of a Kopis or Khukri (sp?). I also wonder how these swords handle given that they widen towards the tip. Oh, sword and buckler in India! Somehow people all over this planet come up with similar ideas. I guess the fencers on these pictures are Sikhs. By the way Tyler Weaver, is your sig. a picture by Ramon Perez? Also, you might find more info on Indian martial arts with the term Kalarippayat, or just Kalari. My point exactly. Sword and shield combat is given surprisingly sparse treatment in European fighting manuals versus the reams and reams on longsword combat (or sword-and-buckler, or fighting to the death with sickles for that matter), and I cannot recall ever seeing or hearing of the situation we're talking about here (more or less), a two-handed sword versus a sword-and-shield fighter, being described. This makes it awfully hard to reconstruct. Was it taught in fencing schools, and longsword techniques developed to fight against it? Almost certainly, but it seems that that knowledge has been lost. The same thing applies for kenjutsu versus sword-and-shield fighters - Japanese swordsmen slashed their way through their fair share, but the techniques and tactics weren't passed on to the modern day. I was speaking generally. I'd say that the similarities between two-handed swords here outweigh the differences involved. The lack of training manuals is a problem and I doubt that sword & shield versus Longsword would have been practiced for duels or judicial combat. But battlefield use would be a different thing as you can't decide in advance or rules don't limit the weapon combinations one might have to deal with. What do we know of battlefield techniques and how they would differ from one on one fighting: Do any of the known fighting manual deal at least in passing with battlefield conditions ? We could even wonder if group tactics were trained for: Mixed weapons small unit fighting ? knight, sergeant, a couple of squires, pages plus half a dozen men-at-arms with polearms and an equal number of archers or crossbowmen ? Even if no formal training was practiced a group like the above after many years of fighting battles or " Chevauchées " would tend to fight in a coordinated way. Weren't the early Jousts like real battles with just a limited amount of restraint and dulled weapons: Cavalry only or would the footmen get involved in these brawls ? May be getting off topic or simply expanding the subject A LOT. The Sikhs have a reputation as being one the most warlike peoples of India, so I suppose their interest in Martial Arts is understandable. Mikko, thanks for those other links. "You should abhor and avoid manslaying in every form except as a lawful punishment or in common warfare. But in ordinary warfare on the lawful command of your chief, you need to shun manslaying no more than any other deed which you know to be right and good. Show courage and bravery in battle; fight with proper and effective blows, such as you have already learned, as if in the best of humor, though filled with noble wrath. Never fight with feigned strokes, needless thrusts, or uncertain shots like a frightened man. Heed these things well that you may be able to match your opponent's skill in fighting. Be resolute in combat but not hot-headed and least of all boastful. Always remember that there may be those who can give good testimony in your behalf; but never praise your own deeds, lest after a time it should come to pass that you are pursued for the slaughter of men whose death is rated a great loss and the revenge is directed toward you by your own words. If you are fighting on foot in a land battle and are placed at the point of a wedge-shaped column, it is very important to watch the closed shield line in the first onset, lest it become disarranged or broken. Take heed never to bind the front edge of your shield under that of another. You must also be specially careful, when in the battle line, never to throw your spear, unless you have two, for in battle array on land one spear is more effective than two swords. But if the fight is on shipboard, select two spears which are not to be thrown, one with a shaft long enough to reach easily from ship to ship and one with a shorter shaft, which you will find particularly serviceable when you try to board the enemy's ship. Various kinds of darts should be kept on ships, both heavy javelins and lighter ones. Try to strike your opponent's shield with a heavy javelin, and if the shield glides aside, attack him with a light javelin, unless you are able to reach him with a long-shafted spear. Fight on sea as on land with an even temper and with proper strokes only; and never waste your weapons by hurling them to no purpose." Thanks you for the excellent post Elling! Is a full copy of The King's Mirror available? May I second Patrick's comment. Thanks for the very informative post. Really gives a flavour of the time. Wow, I like that Elling. I've never heard of it before, The King's Mirror. Hmmmmm. The king's mirror is a "educational" text, where a father tells his son how to be a trader or a kingsmann. The book ends with a section on the king himself, his duties and exalted position. It is believed to be written about 1250, at King Håkon Håkonson's court in Bergen, Norway. In the section on the kingsman, there are also a reckoning of how a kingsman should train, the weapons, and so on. Thanks, Elling! I'll have to either print that out or drop it on my computer for some good reading material while I'm traveling over the next couple of months! Cool! ...This is an often-repeated sentiment, but it's not factual. I think you need to be exposed to more good Asian martial arts - any JSA practitioner with any breadth of study will have experience fighting all kinds of weapons, both formally and unofficially, "for fun", and with unarmed techniques. " Hell, even kendoka have matches against naginata-do fighters on occasion, something which no European fencer would do. something which no European fencer would do. There are some people with a rather narrow range of combative experience, but that's bad and they need to go expand their horizons. You might look into Lichtenauer's merkverse, and Ringeck's commentary (see Tobler's "Secrets of German Medieval Swordsmanship") before concluding that draw cuts were rarely used in Europe. Lichtenauer (who was THE founder of over 200 years of German longsword teaching) refers twice to the "Drey Wuender" or three ways of wounding a man: strike / blow, thrust and cut. Ringeck's text has a specific section on Abschneiden, talking about how and when to use slices or draw cuts. Fiore also mentions cuts on occasion, in the Giocco Largo section on the rompere de punta, and in the Giocco Stretto section from the ligadure mezzana. Not all WMA practitioners do a lot of cross-training, but this is hardly an unknown area. John Clements' "Medieval Swordsmanship" was writing about doing this (sword vs. spear, etc.) in 1996. Ringeck wrote about it (see the section on harnissfechten) a while earlier. Fiore (also a while earlier) talks a lot about fighting with sword vs. spear, dagger vs. sword, and at one point mentions the Colpe de Villano is a good sword-move against a pollaxe. Yes, the major part of the material does deal with sword vs. sword, or wrestling; but as you said yourself, "Hell, even kendoka have matches against naginata-do fighters on occasion, something which no European fencer would do" (my italics). JSA cross-training is not the dominant method of training either. Yes, I agree that no European fencer has taken on a naginata to my knowledge; but how many kendoka have fought against a pollaxe? I can only join in. Thank you very much Elling. Yet even more nice stuff to read over the cold months. Another thought: Tyler wrote "Any JSA practitioner should be familiar and able to use pommel strikes and other techniques ". Fiore notes that pommel strikes are specifically recommended as the best move in certain situations. Do JSA have any named technique or move that specifically calls for using the blunt end of a katana? Pommel strikes can be used in a very specific situation - when your blade is pointed back / away and your opponent is very close to you - your pommel is the closest thing to his head. Draw cuts may be less emphasized in the West for the same reason that medieval knife fighting concentrates on thrusting attacks. The general feeling is that slicing with knife (or presumably a sword) was probably significantly less deadly than thrusting, most likely related to the common use of armour, and universal use of tough, thick, heavy clothing that may reduce the effectiveness of a slice. The European medieval fighting books were all written at a time when armour of some sort was generally worn on a battlefield. Armour foils slices very effectively - butchers still wear gloves of mail to prevent slicing injuries from very sharp blades. A slice may skitter off armour, or only draw a groove in it; a blow may at least stun an opponent or knock him down, if it doesn't penetrate the armour, and thrusts are by far the best way of dealing with armoured men. Even in civilian situations, Europeans generally wore layers of clothes (no central heating!) consisting of linen and thick wool, so getting a deep slice wasn't so easy. Well, the abschnieden are primarily aimed at the hands, which are much more vulnerable to slices than the rest of the body. Slices to the torso where a thick wool doublet may have been worn, for example, may wound the opponent but not necessarily enough to put them out of the fight. That said, it's a HUGE generalization to say that European swordsmanship doesn't use drawcuts. Liechtenauer's system, as much as I love it, is a tiny slice of the centuries of European swordsmanship, not even getting into the fact that it is from one part of the culture. Moreover, the very design of Japanese swords allows them to do something very well that most European designs can't, at least not well - draw cuts. Is every longsword from the 13th century to the 17th exactly the same? For that matter, is every katana? The answer is an unabashed "no". You can't make such a claim. I was lucky enough to handle the original Schloss Erbach sword that A&A does their reproduction of. Despite being several hundreds of years old, I certainly wouldn't run my bare finger down that blade. Likewise, some katana were not nearly as sharp as many people assume. There's a huge spectrum of weapons and styles, and this thread is largely ignoring that. Thanks to the sword's curve and the layout of the hilt and guard, instead of merely clubbing someone with your pommel or quillons (which may or may not faze a determined opponent), you can lay your blade on his body, give it a jerk, and cut him damn near in two. Firstly, I think you downplay just how incredibly deadly a strike with the pommel or quillons can be. Secondly, I think you also aren't clear on what the contex is of using the opposite end of the sword. These are closing techiques, which are used in conjuction with the arm locks and throws that are very similar to the ones seen in JSA. I'm no JSA expert, but I've done enough to know there's more similarity than difference. I like the cross guard on a medieval European sword. That's because I practice medieval European swordsmanship. But it'd probably be a huge annoyance to me if I still actively practiced JSA instead. I'd probably keep hitting myself with it. Hell, even kendoka have matches against naginata-do fighters on occasion, something which no European fencer would do. That's puzzling. I've done it myself. Heck, I've done foil vs. naginata, as well as various other pole weapons. It's a fun little experience, even if not very telling. Oh, on the flip side, I think it's worth noting that Ringeck mentions very few cases of pommel strikes or half-swording in his commentaries on unarmoured combat. Not ALL longsword masters half-sworded and used the opposite end at every instance.